This handy reference book brings together under one cover an incredible variety of information useful to designers, technicians, and students who work behind the scenes in theatre, film, and television. Its sturdy leatherette binding will stand up to years of constant use in any shop. No wonder it’s one of the most widely used stagecraft textbooks among industry pros, community theatres, educators, and students! The third edition updates this popular reference book with new terminology and materials and adds dozens of new illustrations of grip hardware, film lighting equipment, and painting tools. 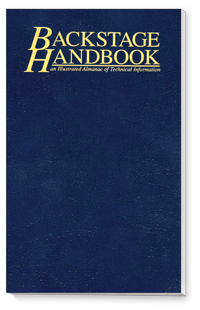 Backstage Handbook includes chapters on Tools, Hardware, Materials, Electrics, Shop Math, Architecture, and Theatre. Read more...There are hundreds of illustrations, tables, and charts which cover everything from the stock sizes and specs of wood screws, to safe working loads for several kinds of rope, to illustrations of 22 types of standard lamp bases.